It only has 4 ingredients…and the cooking process couldn’t be easier to make…and memorize! 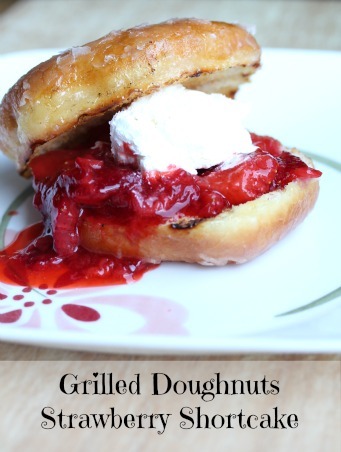 Doughnuts – slice and grill for 2-3 minutes. Strawberries – mash and pour sugar over the top and let sit for a few minutes. I used glazed doughnuts and I was a little worried that the glaze would melt off while they were on the grill, but turns out that it did melt a little, but ended up caramelizing around the edges. This “shortcake” had a perfect slight crunch on the doughnut, combined with a just sweet enough strawberry “sauce”…rounded out with the creamy whipped topping. Amazing way to end a summer night’s dinner! Dollops of whipped cream, or scoop of ice cream. In a small mixing bowl, mash the strawberries with a fork, allowing some of the juices to seep out. Sprinkle the sugar over the top and let sit for 10 minutes, stirring once or twice. While the strawberries rest, grill the doughnuts. Place the sliced doughnuts, inside part down over the flame on the grill for 2-3 minutes. Remove from the grill and serve immediately with the strawberry “sauce,” and whipped cream or ice cream. This recipe is featured on Meal Plan Monday #115. Oh my gosh Erin that looks amazing! Both my husband and I are drooling over here. Going to be watching for some glazed doughnuts on the bakery discount rack this week so I can make this! My hubs was all “don’t grill mine, I’ll just have a doughnut and berries separately.” Yeah, he devoured what was left of our son’s, then went ahead and had a grilled one. So good. Also, I don’t know who you super human people are that can mash strawberries with a fork… but, I had to throw mine in the Ninja for 6-7 pulses.